UNMISS peacekeepers have been assisting displaced civilians in South Sudan by providing protection, building sanitation facilities and giving medical support. Secretary-General Ban Ki-moon called a crisis meeting of his top advisers on the deteriorating situation in South Sudan today and proposed reinforcing the United Nations peacekeeping force there in a bid to stem a conflict increasingly marked by ethnically targeted killings. “I am determined to ensure that UNMISS [UN Mission in South Sudan] has the means to carry out its central task of protecting civilians,” he told a news conference at UN Headquarters in New York just hours after arriving back from a visit to the typhoon-ravaged Philippines. “I will be spending most of today calling regional leaders and others to bolster military support for UNMISS, as well as political backing for efforts to defuse the crisis,” he said of the force, which currently has over 6,800 troops and police in the country, where tensions burst into open conflict on 15 December when President Salva Kiir's Government said soldiers loyal to former deputy president Riek Machar, dismissed in July, launched an attempted coup. Mr. Kiir belongs to the Dinka ethnic group and Mr. Machar to the Lou Nuer, and Mr. Ban said he was “especially worried” by reports of ethnically targeted killings in the conflict, in which tens of thousands of people have been displaced, including some 45,000 now seeking protection at UNMISS bases. The Security Council held emergency closed-door talks with Assistant Secretary-General for Peacekeeping Operations Edmund Mulet to discuss the Secretary-General's proposals to reinforce UNMISS with 5,500 more peacekeepers as well as additional assets. The 15-member body is scheduled to meet on Tuesday to take action on a draft resolution presented by the United States on the matter. Ambassador Gerard Araud of France, which holds the Council's rotating presidency this month, told reporters afterwards that fighting has expanded to many parts of the country, violence continued to follow ethnic lines, and the humanitarian situation is worsening with some 100,000 people internally displaced, according to UN officials. Yesterday UNMISS said that, as a precautionary measure to reduce pressure on its limited resources, it will relocate non-critical staff from Juba, South Sudan's capital, to Entebbe in Uganda. It has also relocated all remaining civilian staff from its compound in the Jonglei state capital of Bor to Juba. At the same time, the Mission is planning to reinforce its military presence in Bor and Pariang to continue fulfilling its mandate to assist the Government of South Sudan in carrying out its responsibility to protect civilians. “We are already approaching countries to help meet the new requirements. We are also looking at other peacekeeping missions, while taking care not to reduce their capacity to respond to threats where they operate,” he added. “UNMISS is protecting civilians at its bases, supporting humanitarian deliveries, monitoring the human rights situation and investigating reports of abuses,” he noted, praising “our brave peacekeepers,” as well as the mission's staff and leaders. He stressed that he has repeatedly called on President Kiir and opposition leaders to come to the table and find a political way out of this crisis. “Whatever their differences may be, they cannot justify the violence that has engulfed their young nation,” he said of the country which only became independent in 2011 after seceding from Sudan. Mr. Ban also appealed directly to the people of South Sudan, pledging full UN support. The UN Humanitarian Coordinator in South Sudan, Toby Lanzer, who has just returned from a visit to Bor, where some 17,000 people have sought protection in the UN peacekeeping base, today appealed to donors to make resources available so that aid agencies can bring in the necessary managers, specialists and supplies without delay. “While there, I witnessed firsthand the harrowing results of the intense violence that has swept the area,” he said in a statement in Juba. “I heard heartbreaking accounts of people's suffering, including tales of children separated from their parents. Aid workers are also under intense pressure, with humanitarian compounds looted in several locations. Meanwhile UN agencies and non-governmental organizations are providing life-saving services in two UN bases in Juba where 20,000 people have sought shelter, including water, sanitation and emergency healthcare. Latrines are being dug, high-energy biscuits provided to meet the urgent nutritional needs of children and other vulnerable people, and emergency surgical supplies, drugs, and reproductive health kits delivered to hospitals around Juba. Aid agencies have also been able to deliver food to some 7,000 people who have sought shelter in the UN peacekeeping base in Bentiu, Unity State. 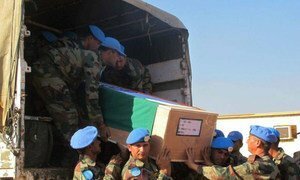 The United Nations Mission in South Sudan (UNMISS) held a memorial ceremony in Juba, the capital, today for two Indian battalion peacekeepers who died in the 19 December in a brazen attack on its base in the town of Akobo in restive Jonglei state.